Those of you who have known me for a while are probably aware that I am rarely at a loss for words (opinionated? me?). 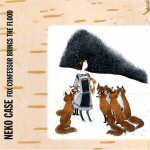 But after having listened to Neko Case's new cd Fox Confessor Brings the Flood a few times now, I am still so flabbergasted that I don't really know what to say about it. Generally when I first start listening to a new cd, I hear a couple or three songs that strike me right off the bat, while the rest grow on me more slowly. And that is not a bad thing. Some of those immediately-catchy songs grow a little tired after too many listens, while the slow boilers grow stronger with each listen. Fox Confessor Brings the Flood throws all of those assumptions right out the window. I found myself going to the liner notes with the start of each song, needing to know what am I listening to? But it's not that the songs on this cd are what you would call catchy songs - far from it - rather they are instant classics. Neko Case just gets greater and greater with each passing album. Her voice is one of the most powerful forces in the Western Hemisphere. I am in awe. But rather than just listen to me drool incoherently, please go to Will's New and Used Records for a proper review of this cd. Will says it so much better than I ever could. He is, after all, the man who said about Belle and Sebastian "frontman Stuart Murdoch has one of those voices where you simply want to listen to everything he has to say." How very true. The best I could come up with was to gush that "Stuart Murdoch has the sweetest voice this side of heaven", and to refer to his voice as a "gay choirboy yodel" (which I stole from the NME, for Christ's sake!). So, I urge you, to go right now to Will's site. And while you are at it, pass Go and collect $200. And then go out and buy Fox Confessor Brings the Flood. Well, Barbara, you are too kind with regards to my reviews. I did enjoy reading this one quite a bit. She is just so amazing, from the voice to the lyrics to the musical arrangements. Everybody else could learn a bit from her. Guess what got muted, and who got turned up. Will, I truly enjoy your reviews. And with Neko Case it is so easy to write a glowing one. You are right; she really is an example of how to do things right. I will definitely be checking out Neko Case. Thanks for the recommendation. Good to hear Jeff. You should also check out her cd, Furnace Room Lullaby. It's great. I looooove Neko. She is terrific. I also looooove your blog but have been neglecting to comment recently. Still reading I promise! Ruhee, how was your audition? No worries about not visiting a lot recently - you've been busy busy. I still haven't heard your last podcast but plan to indulge in it tomorrow. Happy birthday! Soon?